This essentially defensive response, however, is going to be coupled with some kind of “offensive” (albeit not necessarily kinetic) pressure against NATO itself. Just how ambitious the primary goals of this pressure will be is not clear. The goals could be very ambitious, including bringing about the collapse of the European project and/or the fracturing of NATO. Or they could be more modest – for example, bringing the United States to the bargaining table to negotiate some kind of European security agreement, including limits on force dispositions and NATO expansion (so more-or-less the kind of security arrangement that Henry Kissinger has been advocating, most recently in his interview in The National Interest). That said, my guess is that the Kremlin has concluded that Western governments are unwilling or unable to negotiate a broad security pact with Moscow. I also suspect that they believe, doubtless correctly, that whoever enters the White House in early 2017 is going to be less willing and less able to compromise with Moscow than President Obama has been. Accordingly, I expect the Kremlin to decide that its least-worst option for limiting NATO’s eastern pivot is to intensify efforts to divide Europe and the Western alliance. That is particularly the case because economic constraints are going to make it increasingly difficult for the Kremlin to meet its rearmament objectives and hold its own in its escalating arms race with NATO. If so, I expect Moscow to continue to probe Western defenses aggressively. It will also continue to engage in various acts of military brinkmanship (e.g., sending military aviation with transponders off into commercially trafficked international airspace near NATO borders). It will continue its program of plausibly-deniable cyber espionage and cyber vandalism. It will continue to engage in what might be called acts of political brinkmanship, such as the kidnapping and imprisonment of the Estonian intelligence officer Eston Kohver. It will continue to threaten military counter-measures against countries like Georgia, Ukraine, Sweden, and Finland if they seek to join NATO. And it will continue to use information assets, and to the extent possible financial assets, to support anti-system parties of both the right and left in Europe. At some point, however, I think the Kremlin is going to have to choose between political/economic inducements and military intimidation as the primary instrument for dividing and weakening the West. When that happens, it will probably decide that intimidation is the better option. 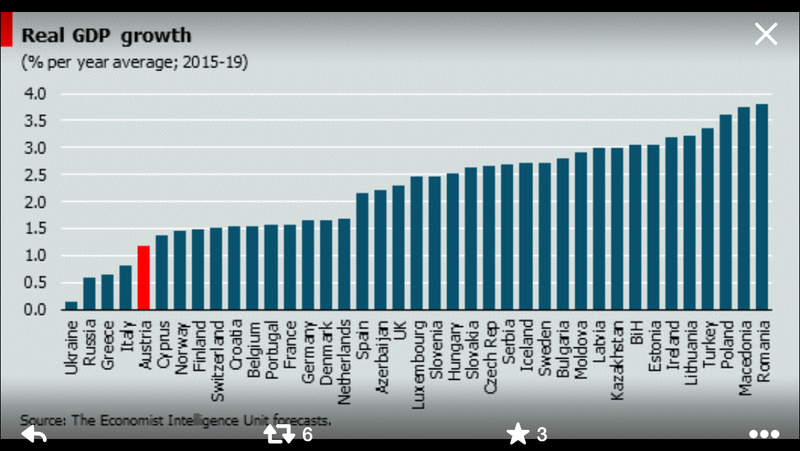 That calculus could change if anti-system parties really gain strength in Europe, or (relatedly) if the E.U. and/or U.S. entered into serious recessions. Moscow might then decide that acting more benignly would make it easier for pro-Russian parties to come to power in at least some European capitals, in which case they would be in a position to block the renewal of sanctions and/or increased military spending, and force enhancements in the east. I doubt, however, that the Kremlin will ultimately take that path, for several reasons. First, it is unlikely (but certainly not impossible) that either the E.U. or U.S. is headed into another recession, despite the recent turmoil in equity and currency markets. 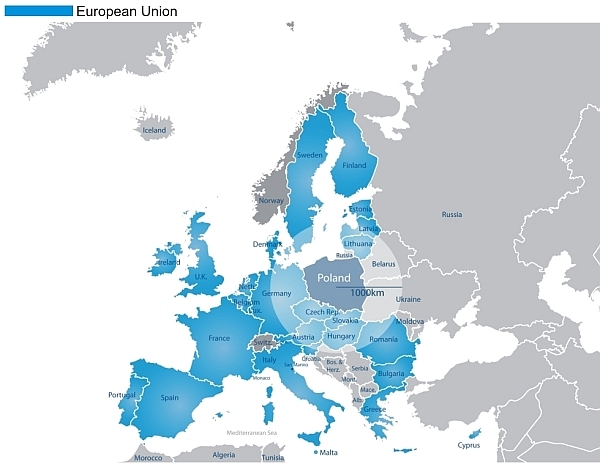 Second, while anti-system parties may take power in some additional European capitals, it is unlikely to happen in many, and if they do they will likely make improving relations with Moscow a low priority (as has been the case with Syriza, at least to date). Third, lifting sanctions won’t help the Russian economy much if oil prices stay low. Fourth, the Kremlin is doubtless aware that the United States is not going to go along with a softer line toward Russia. That is true for the key frontline NATO states as well: Estonia, Latvia, Lithuania, Poland, and Romania. (It is somewhat less clear for Bulgaria, although my sense is that military cooperation between Bulgaria and NATO remains pretty extensive.) So, too, with NATO’s “partners” in the region – Ukraine, Georgia, Finland, and Sweden are not going to moderate military spending or cut back on military cooperation with NATO and/or the United States simply because anti-EU parties come into office in France or Spain. In short, Moscow’s NATO problem is not going to be solved by political developments in Western Europe (unless, of course, the Kremlin were willing to accept terms that most Russians would consider a humiliating capitulation, which I consider extremely unlikely). As a result, the Kremlin is likely to focus increasingly on military intimidation, the goal being to raise the fear level in the West. In doing so, it will seek to avoid an actual military conflict with NATO. But its dilemma will be that scaring Western publics enough to make a difference will probably require it to do things that entail a significant risk of conflict. 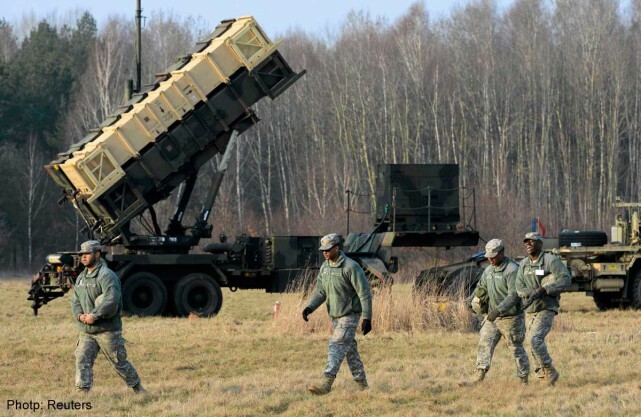 Deploying Patriot missile batteries or building a sophisticated air defense system in Lithuania, Estonia, and/or Latvia. 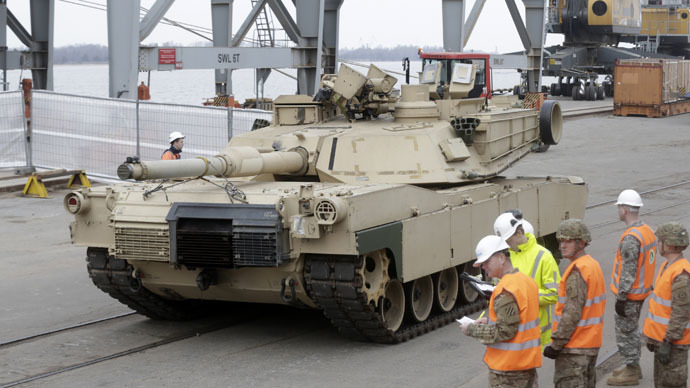 Building an integrated air-defense system all along NATO’s eastern flank. Increasing the number of U.S. TNWs (estimated at around 200) in Europe. Withdrawing from the Intermediate Nuclear Forces (INF) treaty (which bans land-based intermediate range ballistic and cruise missiles with a range of 500 to 5,500 kilometers) and reintroducing intermediate range nuclear-capable ground-launched ballistic and/or cruise missiles to Europe. Redirecting NATO’s European ballistic missile defense system to target Russian ballistic missiles. Taking concrete steps to bring Sweden, Finland, Ukraine, or Georgia into NATO. The question, then, is what are the military steps that Russia is likely to take to increase pressure on Europe and respond to NATO’s planned or possible force deployments? My guess is that it will do some or all of the following. Make even clearer than it already has that it will use tactical nuclear weapons (TNWs) for territorial defense if need be. 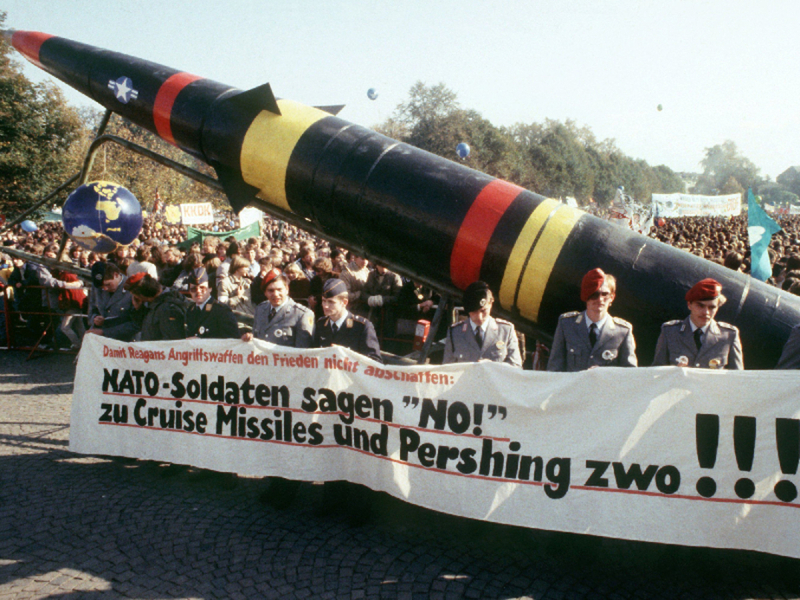 In doing so, it will be mimicking NATO “flexible response” strategy vis-à-vis the Warsaw Pact during the Cold War, whereby the United States refused to adopt a “no first use” nuclear policy because it faced much larger conventional forces across the Iron Curtain. In general, the more the economy limits its ability to spend money on its conventional forces, the more it is going to rely on nuclear weapons. It is widely assumed that the Russian armed forces are equipped with some 2,000 battlefield nuclear weapons. 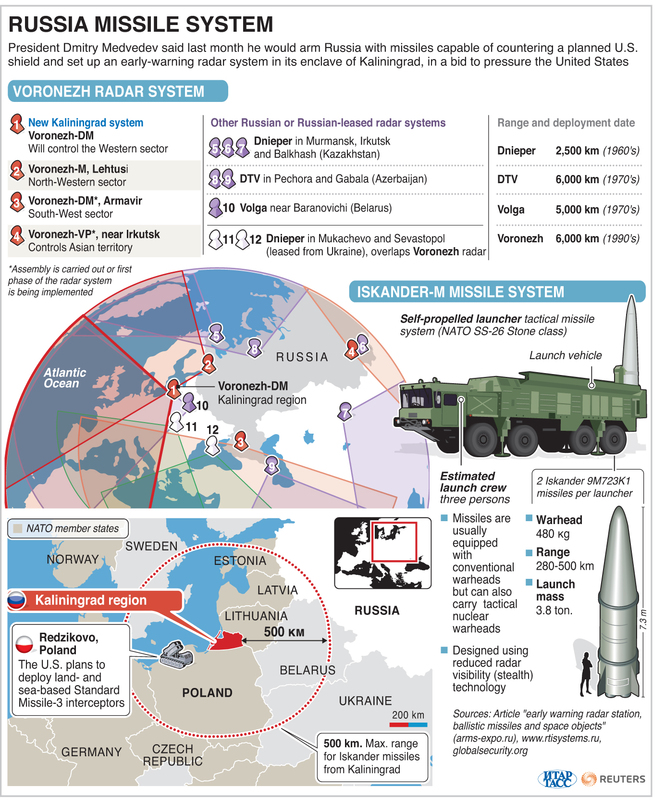 Openly, and permanently, deploy nuclear-capable short-range Iskander-M ballistic missiles and dual-capable bombers in Crimea and Kaliningrad, and make clear that they are armed with nuclear weapons and that their mission is to target NATO’s military assets in the frontline states. Deploy a new nuclear-capable intermediate range naval cruise missile, the SSN-30A, which Western intelligence asserts has a range of over 900 miles, making it capable of reaching much of Western Europe from surface ships or submarines stationed in the Black and Baltic seas. Deploy an intermediate-range, nuclear-capable ground-launched cruise missile (GLCM) and announce its withdrawal from the INF treaty (assuming the U.S. does not do so first). The U.S. has accused Russia of testing a GLCM that violates INF limits, and it can be assumed that deploying one could be effected relatively quickly. The military significance of these moves is subject to debate. The willingness of Russia to use nuclear weapons for territorial defense is nothing new. (Indeed, it is safe to assume that any nuclear-armed state would use nuclear weapons if faced with defeat on its own territory.) Moreover, Russia’s forces in Kaliningrad and Crimea are already nuclear capable, and Russia, like the United States, does not announce which naval vessels have nuclear weapons on board or where its TNW assets are located. Most importantly, Russia has plenty of nuclear-armed long- and medium-range bombers and cruise missiles that are capable of reaching West European capitals. But the main purpose of these military moves would in any case be political – to raise the fear level in Europe. A secondary political payoff would be assuring the Russian public that the Kremlin is taking prudent and necessary steps to deter NATO aggression and defend the homeland. Their primary military significance will be to make an already unstable military balance along the NATO-Russia contact line even more unstable (which NATO deployments are also contributing to, even if NATO’s intent is to enhance deterrence). From Moscow’s standpoint, greater instability serves a purpose, in that it would contribute to the fear level in Europe. As a result, I doubt that Moscow is interested in negotiating an agreement on confidence building and crisis control measures, as recommended this week by the European Leadership Network (see their otherwise very sensible recommendations here). An American official recently made the point as follows: Russia’s cruise missile deployments are “like putting SS-20s in Europe again.” For those who don’t remember, the USSR’s deployment of the SS-20 intermediate-range ballistic missile (IRBM) and the U.S. deployment of Pershing II IRBMs caused a political storm in Europe in the early 1980s, contributing to the mobilization of a potent disarmament movement in Europe (and to a lesser extent in the U.S.). In short, faced with few good options for responding to what it considers a sharply deteriorating security environment, my guess is that Moscow is going to resist measures directed at enhancing military stability, at least for the next several years. Instead, it is going to end up highlighting, and enhancing, its ability to deliver nuclear weapons to Western Europe. 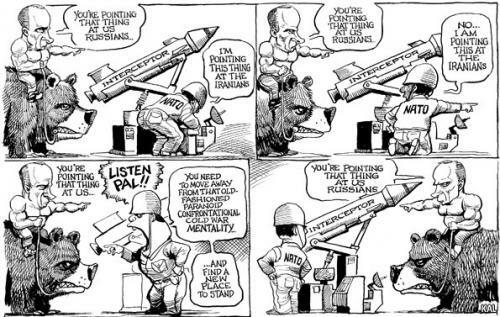 Basically, Moscow’s position will be: You pose a vital threat to us, so we are going to pose a vital threat to you. And we have a higher threat tolerance than you do. That, in fact, is how I interpret what Russian security officials are saying when they threaten countries like Poland, Romania, Denmark, Sweden, or Finland with countermeasures should they participate in NATO’s European ballistic missile defense system, or in the latter cases if they move to join NATO. Beyond these strategic level responses, I expect Moscow’s military response to focus on what the Pentagon calls Anti-Access/Area Denial (or A2/AD) measures in the Black Sea, in the eastern Baltic Sea, and in the Arctic. In the latter case, it well may decide to use its military presence to support its territorial claims in the Arctic, much as China has been doing in the South China Sea. 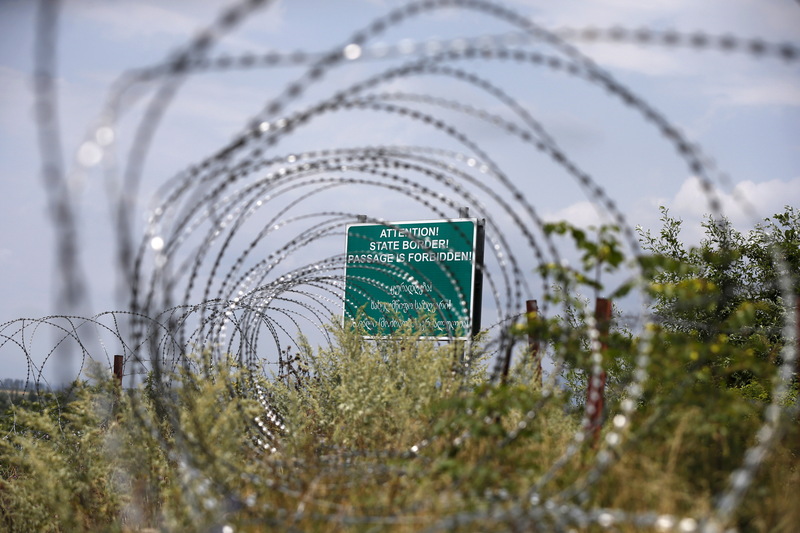 A warning sign behind a wire barricade erected by Russian and Ossetian troops along Georgia’s de-facto border with South Ossetia in the village of Khurvaleti, Georgia, July 14, 2015. Reuters. Should NATO take concrete steps to bring Georgia into NATO or go too far in providing military assistance to Tbilisi (yesterday marked the opening of the NATO-Georgia Joint Training and Evaluation Center in Tbilisi), Moscow may respond by pushing the so-called Administrative Boundary Line (ABL) that separates Georgia proper from South Ossetia further south, effectively severing Georgia’s east-west transportation/infrastructure corridor. At the least, it will ratchet up its threats to precipitate another war with Georgia. 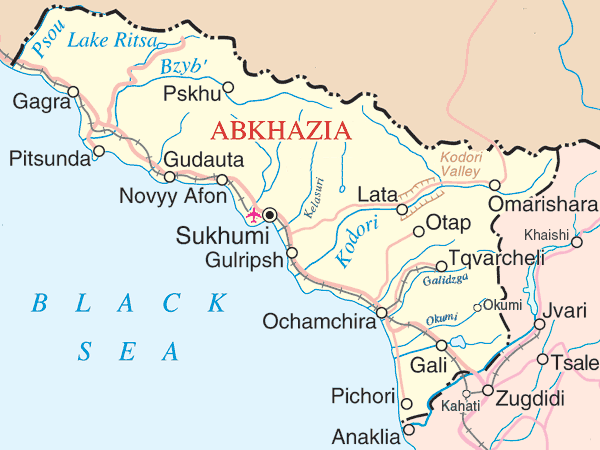 That, I believe, is how to interpret Moscow’s recent extension of the ABL and of the rail line from Ochamchire in Abkhazia south toward the Inguri River. They should be seen as warning signals, and they should be taken seriously. In effect, Moscow is suggesting that if Georgian-NATO cooperation goes much further, Georgia could face another disciplinary action like that in 2008. Deployment of such a military facility of the North Atlantic Alliance in Georgia will become a serious destabilizing factor for the security in the region. Such a conclusion is based on an existing tragic experience; you all remember the events of August, 2008 – Georgia’s aggression against South Ossetia; no one has a doubt that declaration on Georgia’s NATO membership perspective at the Alliance’s summit in Bucharest in April, 2008, inspired a kind of illusion of all-permissiveness among the leadership in Tbilisi and largely encouraged criminal attempt to solve the conflict through use of military force and to invade South Ossetia. Judging from some Georgian politicians’ actions and statements, Georgia has not reconciled with the irreversible consequences of its adventure in 2008 and still claims territories of its neighboring republics, and persistently declines to sign documents on non-use of force. The obvious point is that, at least for now, NATO is no better a position to defend Georgia against a military incursion by Russia than it was in 2008. Finally, it is not beyond the realm of possibility that the Kremlin will encroach on Finnish territory should Helsinki seek to join NATO. Finland has a long and lightly defended border with Russia. That, no doubt, is why the Finnish president made clear earlier this week that Finland would not come to the assistance of Estonia, Latvia, and Lithuania if they were attacked by Russia. As he put it, “Finland is not in a position where it could offer others security guarantees which we ourselves don’t even have.” The subtext, as I read it, is that Finland would have to take measured military steps to try to convince Russia not to attack Finland in the event of conflict in the Baltic republics. At the risk of sounding like a one-note Charlie, I will again make clear that I think the crisis in Russian-Western relations is very dangerous. While a direct NATO-Russia clash is unlikely, it is possible, and the consequences would be awful. The essence of the problem is that each side is being driven by a security logic that is going to make the military relationship increasingly dangerous unless and until some kind of arms control process gets underway. For the U.S. and its NATO allies, that logic is the need to deter Russia from attacking a NATO member-state or NATO partner country. For Russia, it is the need to keep the U.S. and NATO from challenging its military supremacy in its immediate environs and undermine its political position in Eurasia. Nor is the crisis likely to de-escalate due to an about-face in either Moscow or the West. Putin is unlikely to back down and or go away, and Washington is not going to stop trying to enhance its ability to defend its eastern flank countries or help non-NATO countries like Ukraine, Georgia, Sweden and Finland defend themselves. And finally, the Kremlin is not going to treat NATO’s moves as inevitable or irreversible. It is going to do something. The question is what.